What do you get when you equip a fashion designer with a paint brush, thick black ink and no set boundaries..? Yeah, that’s correct; utterly fabulous artwork. Meet Stockholm based Eitil Thorén Due and his art project PEYTIL. 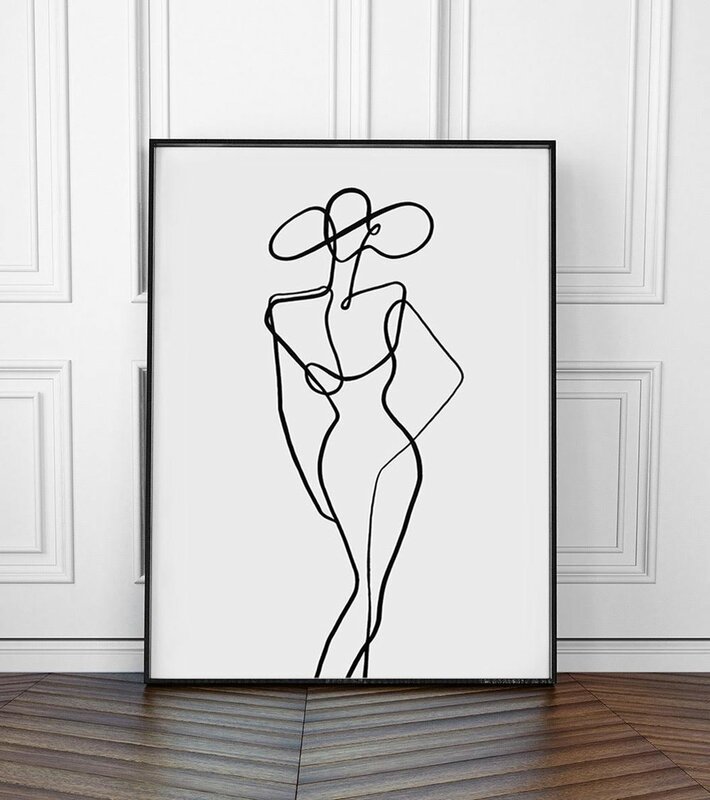 Taking inspiration from his background in fashion, Eitil works his way across the canvas with his distinct swirling movements, in what he calls ‘graffiti-like spontaneity’, leaving behind lines of black ink depicting vivacious female silhouettes and portraits, resulting in beautiful minimal and timeless artwork, that seems to be on everyone’s walls at the moment. 1 // Who are the person behind Peytil and what is the most interesting thing to know about you? My name is Eitil Thorén Due, I’m an artist and fashion designer based in Stockholm. I grew up in a family of artists, my mother is a sculptor and my father is a painter. Art and creativity has always been something natural and fun for me. I never went to any art school or design school, I guess I’m learning along the way. 2 // When you were a little boy, what did you want to be when you grew up? I always wanted to be a fashion designer, I started a fashion brand together with my brother when I was 21, it’s called Mouli (@moulistockholm). 3 // How did your artist adventure start and how has your journey been up until today? After working several years as a fashion designer I wanted to create another outlet for my creativity. I began to see commercial fashion as something very restricted and I was longing for something without rules or limitations. That’s when I started Peytil, which is a print concept where I paint and draw, both traditionally and digitally. I paint fashion illustrations and different kinds of portraits. 4 // Could you describe your technique in more detail? And how many attempts do you have to go through to perfect that fascinating continuous line? I try not to have too much of a strategy I just paint and sketch a lot, sometimes it turns out well and then I continue in that direction. Many attempts I guess, more than I can count. But also sometimes it’s there from the beginning. My mom used to say ”I should put a log on the fire everyday”. Some days it’s not working at all, and that’s also part of the process. 5 // What inspires you? I think inspiration is kind because it’s not hidden deep down in some difficult place, it’s everywhere. In peoples postures or facial expressions. In songs or books, and everywhere in the nature. It depends more on your mood than on your surroundings I guess. If I sleep and eat well, I feel inspired. 6 // How does your process from idea to finished artwork look? I sketch a lot in small books all the time, without any pressure. I have ideas all the time and it’s important to get them down on paper. Sometimes it looks interesting and then I can take them with me to the studio. In the studio I’m more focused. The artwork is either finished in there, or I photograph it and finish it in the computer. 7 // What is your favourite part of this process and why? I love to paint with thick Chinese ink on white rough papers. The hard contrast is appealing to me. I’m happy doing what I do now so hopefully I’m still at that point where I’m able to work with what I love. 9 // And lastly, would you have any good advice to aspiring young artists wanting to follow in your footsteps? I’m quite young and hopefully aspiring so maybe I’m not the one to give advice. But if I did I’d probably tell them to follow their own path and not follow anyone else's footsteps.